Show 2 of Hustle Brand Radio we welcome Tre 8 Thirty eight from Memphis Tennessee ,1Choice of Australia, Sugar Joiko of Houston, Texas ,Black Finn of Chicago IL ,Adesha of Oakland Ca and 3 two one of Africa . Plus more great indie R&b and Jazz Oh yeah also Columbus , Ohio very own Hellagreeno Don't forget to follow us on I.G. 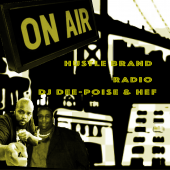 Hustlebrandradio @djdeepoise on everything and @hefchulo (YOU KNOW!) Want to be the show hustlebrandradio@gmail.com is the email!!! until next time Peace! !